Rad Runners! We've teamed up with Jasyoga to bring you Workout Wednesday! We’ll be serving up a variety of speed workouts, threshold intervals, tempos, fartleks and more. Each week, we’ll work alongside Jasyoga to incorporate complimentary Jasyoga Reset Routines to keep your running healthy and strong! 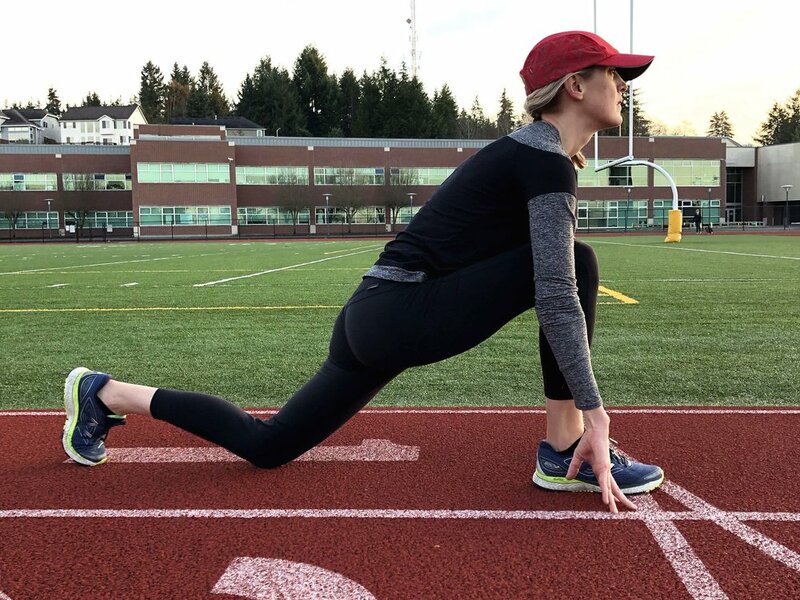 When doing fast workouts on the track it’s common to get tight and cranky hips or to run into “booty lock”. To nail your workout and absorb the full benefit of your effort you need your hips working with you rather than against you. These post-track Hip Resets are essential. Check out Jasyoga’s top yoga for runners routines in the plan section below and if you’re not a Jasyoga Video subscriber yet, start your free 14-day trial anytime. This gives you access to Jasyoga Video online and app on iOS and Android. Oh and psst… one free month of Jasyoga is included with our premium coaching plans. If you’re interested in working with one of our coaches, send us an inquiry and we’ll set up a time to talk shop about your running goals! Cool Down: 10 min easy jog + Quick Post-Run Hip Reset immediately post-workout / followed by Hip Maintenance with Stephanie Violett later in day to fight booty lock. Rep workouts like these are great for building efficiency for longer, slower paced workouts and races (imagine miles per gallon in your car). By doing this kind of work weekly, you’ll feel more comfortable and relaxed at 5k, half marathon, and marathon paces. Try to run the 200s at a pace you estimate you could maintain for an all-out mile. The rest should be double the amount of time each 200 takes you. For example, if you are running your 200s at :45 second pace, you should aim for 90 seconds rest. The recovery should feel long — the goal is to clear the lactate because it should never be a limiting variable with this type of workout. The total volume of this workout should be about 5% of your weekly mileage, so feel free to adjust the amount of 200s you do based on your own training plan! For example, if you’re aiming to hit 20mpw, you’ll want to total 1 mile of rep work (8 x 200). Visualize shortening your stride, running tall, and driving your arms. Almost a week has gone by since the Boston Marathon and I am still thinking about Des Linden. Why? Many reasons come to mind: I am a huge running fan and love watching all races. Thousands of runners like me have been waiting for this moment for 33 years: an American women crossing the finish line tape first. Boston this year had exceptionally nasty weather and everyone involved had to persevere despite those conditions. However, that’s not the reason that I keep thinking about her. If you listen to her post race interview she tells you that early in the race it wasn’t her day. She was doubting herself and believed that she wouldn’t finish. So when Shalane leaned over to Desi to say that she was going to run to the bathroom and that she would try and reconnect with the lead pack, what did Desi do? She told Shalane that she probably wasn’t going to finish the race so whatever she could do to help her she would. She decided to be selfless in that moment and slow her pace so that when Shalane came out she was between the lead pack and Shalane. She made a choice to help her get back up there because if she wasn’t going to have a chance at winning she wanted her American teammate to. Wow. Watching it all happen I couldn’t believe it but knowing this back story and watching it again later that night I was struck with something I knew from my own running story too. When you are selfless, when you set your thoughts to helping others instead of yourself it is amazing what transpires. Your self doubt talk deep inside your head fades away because what you are left with is one mission – to help that other person succeed. Early on in my coaching experiences I was fresh out of college and just starting out with high school coaching. I was a bit burnt out from my own running because I had dealt with a long road back from injury and things weren’t working out. So this new coaching gig was a blessing in disguise. I had a purpose that combined my love for the sport and also my desire to help others. In the first five years of coaching I did things in workouts that I couldn’t do as well in my college years. Why? I was trained well in college and had a competitive environment surrounding me. It was because I was so deep in my own head and my own thoughts that I couldn’t let go. And when I was coaching and only thinking about my athletes succeeding it just happened and I cranked out paces and miles I didn’t think were possible. So, maybe Desi’s selflessness can be a lesson for us all. When things aren't going your way, when you have lost the passion or the spirit within a training cycle or a race itself, stop and think about how you can help your teammate or your training/racing buddy succeed. Like Desi it might in fact be just what you need to pull yourself out of whatever hole you are in and it might give you that extra pep in your step to get to the next goal; whatever it might be. Get after those big running dreams you have in your heart.